After nearly 5 inches of rain fell on the Cleveland and Bradley County community earlier this week causing flash flooding in several areas, local emergency managers continue to request anyone having flood damage or other reportable problems to contact them. “So far, we have only received one call regarding flooding,” said Troy Spence, Cleveland-Bradley County Emergency Management Agency director. 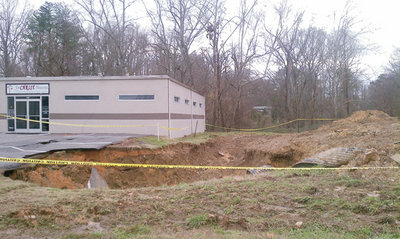 A large sinkhole opened up near the Merita Bread Store located on South Lee Highway after torrential rains Monday. A nearby church parking lot was affected as well. The runoff clogged and washed away a large drainage pipe section. According to Spence, the repair is being performed by the Cleveland Department of Public Works. The area has had sinkholes in the past. Several years ago, the parking lot of Scott’s Furniture developed a deep sinkhole. Just a few hundred yards away, a mobile home park was flooded. According to Spence, none of the mobile homes in the park were inhabited. Michael Noe had stored some of his property in one of the trailers and also had three vehicles parked there. The vehicles were completely submerged under the water which collected on McDonald Lane. Spence said Monday afternoon that many of the problems came from brush and leaves being “piled” in or near drainage ditches. “A great deal of flooding issues in residential areas were due to fall leaves being placed in ditches or near ditches where they could wash into and clog drainage systems,” Spence said. “We need anyone who may have suffered damage to call our office at 728-7289, or the city of Cleveland Planning and Engineering Department at 728-5114,” Spence said. “We are attempting to collect historical data regarding any flooding or near-flooding issues,” he explained. “If water came close [to structures], touched or flooded, we would like to have that information so we can determine how to mitigate for future occurrences, if any,” Spence said. Spence said Wednesday that CBCEMA has set up a survey for residents who have had flooding issues. This entry was posted in Pictures and tagged Cleveland, sinkhole, Tennesee. Bookmark the permalink.